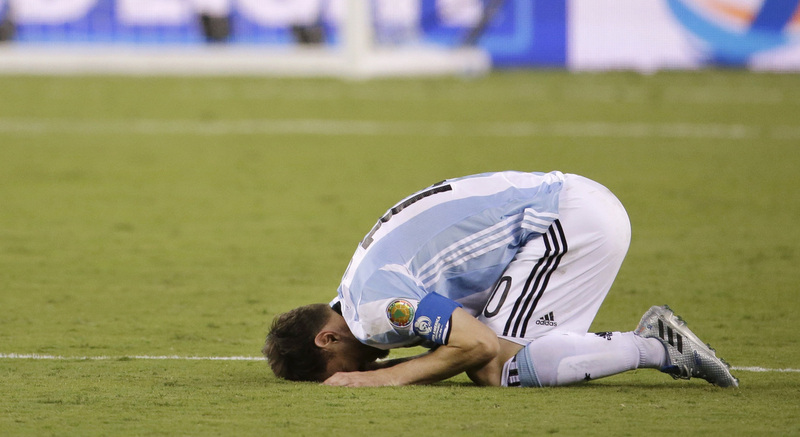 Lionel Messi Says He's Retiring From Argentina's National Soccer Team : The Two-Way But fans hope Messi will rethink his declaration of "I think it's over" once the wave of postgame frustration at Argentina's 4-2 loss to Chile in Sunday's Copa America final has passed. Argentina's Lionel Messi reacts after losing 4-2 to Chile in penalty kicks during Sunday's Copa America final in New Jersey.
" 'I think he spoke while he was heated, because a beautiful opportunity escaped us,' said Romero. 'I can't imagine a national team without Messi.' "
The remarks by Messi followed reports that he'd been frustrated by mismanagement of Argentina's soccer team. When the team's chartered flight was delayed for several hours on its way to New Jersey for the final game, Messi posted on his Instagram account, "What a disaster the AFA is, for God's sake." "Many fans believe that Messi cannot be considered as great as Maradona until he wins a major honor with his country like Maradona did in the 1986 World Cup." Even if Messi does go through with his retirement from Argentina's national team, he will presumably continue to play for his club team Barcelona.